Pence: "We must have American dominance in space"
I've been working on space warfare issues since 1983. At that time I lived in Orlando, Florida (one hour from the space center) and it was easy to pay attention when Ronald Reagan announced Star Wars - SDI (Strategic Defense Initiative). It's never been about defense. The US space program was essentially created by the former Nazi rocket scientists brought over to the US after Hitler was defeated. Much of the heavy lifting to defeat Hitler was done by the Soviet Union which lost 27 million people during the Nazi invasion. 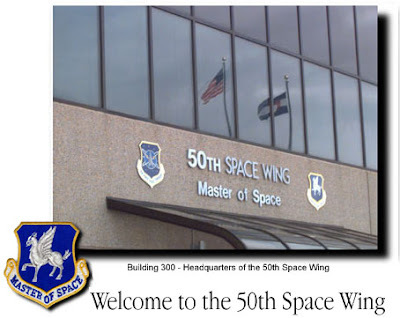 Cut away to 1997 and the US Space Command document entitled 'Vision for 2020' maintained that America would 'control space, dominant space, and deny other nations the use of space'. The US would be the 'Master of Space'. The idea that the US must dominate space is arrogant, stupid, dangerous and highly destabilizing to world peace. Admittedly it is a major opportunity for maximum profits for the aerospace industry and the Trump/Pence 'space force' proposal is largely being driven by that factor. They've long said at the Pentagon that Star Wars would be the largest industrial project in human history. So we've now reached this crisis moment where the expansion of warfare into space is being dramatically promoted and there must be an immediate counter-reaction by the peace loving people around the world. One opportunity we have is the October 6-13 Keep Space for Peace Week that the Global Network annually organizes as a way to increase education and action around this important issue. We urge local groups and concerned citizens to help put together protests and educational meetings during that week. Find our space week poster here. We have a good selection of space videos and documentary films available on the Global Network web site which can be used during space week. Find them here. The aerospace industry is targeting human needs programs like Social Security, Medicare and Medicaid for dramatic cutbacks in order to move those funds into the proposed space force. We cannot let them get away with that. Help us say - space force - NO! Human needs and deal with climate change - YES! The Czech senator Jaroslav Doubrava compared Ukraine to a black hole and said that he doesn’t want to visit the country until its government is replaced. 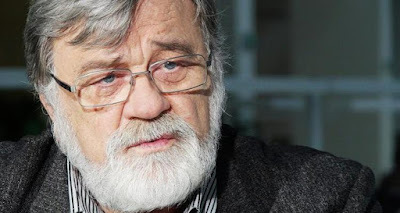 In an interview to the “Parlamentni Listy” publication the senator noted that Ukrainian oligarchs continue fight for financial flows, and all money sent to Kiev as financial aid literally “falls into a black hole”. At the same time, it will hardly be possible to return them. “In Ukraine there is a high level of poverty among the population. Oligarchs dominating in a mafia is a reality in Ukraine. And, unfortunately, this also concerns us, since many Ukrainians come here in order to earn money to support their family,” said the politician. He also noted that nobody in the West cares about the fact that in 2014 a rigid coup d’etat took place in Ukraine, because of which thousands of people were killed, and now fascist trends are observed in the country. The senator is sure that western countries only pursue their own interests in Ukraine. “Fascist trends are obvious. The periphery there, probably, also doesn’t suspect what is happening, and fascists have already placed big cities under their control. I don’t want to visit Ukraine under the present government, I don’t want to walk the same streets where fascists, who shout out nasty things, stride,” added the Czech politician. In addition, Doubrava noted that he has visited Crimea three times already, and every time Kiev protested and issued threats because of an allegedly “illegal visit to the territory of Ukraine”, he personally wrote to Ukrainian representatives and said that he visited the territory of the Russian Federation. Why won't the U.S. leave Afghanistan? Peace talks between the US and the Taliban have been taking place secretly since November. Former US Army Colonel Chris Kolenda and former US Ambassador Robin Raphel have been speaking with their Taliban counterparts in a series of meetings that have taken place in Doha, Qatar. Former US Army paratrooper and Afghanistan and Iraq war veteran Will Griffin discusses the bigger picture. Will also serves on the Global Network's board. Doug Rawlings talks about Peace Studies and shares stories from teaching the subject at the University of Maine-Farmington (UMF). Doug is a Vietnam war artillery veteran and was one of the original founders of Veterans For Peace that got started in Maine in 1985. He was interviewed during last weekends Peace Fair organized by PeaceWorks in Brunswick, Maine. Watch Part 4 of Paul Jay and Aaron Mate’s interactive discussion with viewers about the controversy over Trump’s visit to Helsinki. This is a very relevant and important discussion being led by Mate during recent weeks on the Real News. Thanks to them for this courageous questioning of the corporate brainwashing process. Few are willing to challenge authority - while it is more necessary than ever. No U.S. bases in Okinawa - who will speak for nature? As I lay on my bed with my knee iced (just over three weeks since my surgery) my heart is with the people in Okinawa as they maintain their steady vigil in the water and at the gates of Camp Schwab Marine base at Henoko. Their daily protest at the construction gate and in the bay is a level of commitment that few peaceniks in the west can imagine. Up to 13 years this has been going on each day to say NO to the construction of twin-runways over the bay for US warplanes that are increasingly being sent into the Asia-Pacific. The endangered dugong sea mammals, the 3,000 year old coral in Oura Bay and the people's sacred connection to the water all speak loudly to me even when Okinawa is so far away. The US maintains that these protests are financed and led by China which is pure nonsense. 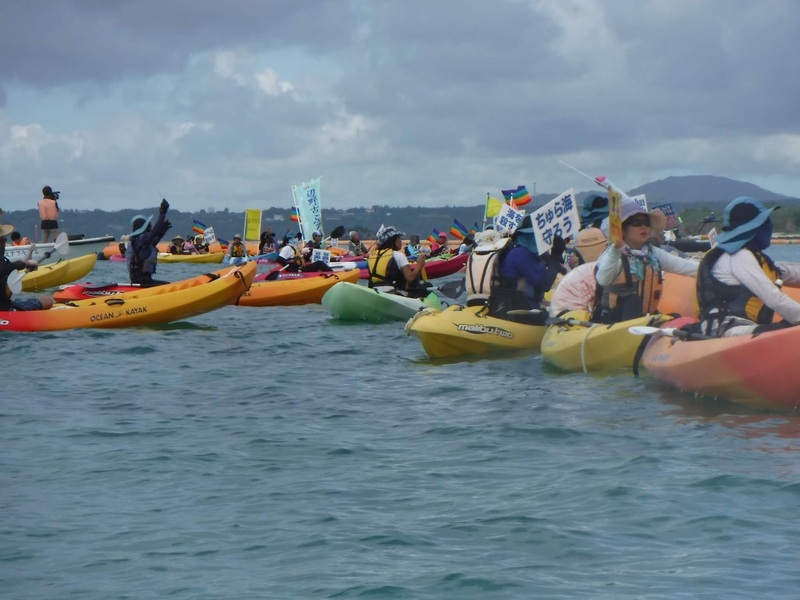 These protests are led by the people of Okinawa who completely understand that if another war happens then their island (occupied by dozens of US military bases) is a prime target. The people are fighting to keep the peace - to introduce some sanity - into the insane Pentagon build up for war on their peaceful island home. Who will speak for nature? Who will speak for the coral and the fish? Who will speak for the dugong? Who will stand with the Okinawan people? Jimmy Dore is one of my favorite news analysts and cultural critics. He is well studied and is growing as he learns more about the deep connections between the ruling oligarchs in America and their use of the Congress and the media to promote a earth destroying pirate version of capitalism. In this interview Jimmy's guest is a good man who served hard time in the empire's jails for standing against the US torture program. John Kiriakou is a columnist with Reader Supported News. He co-hosts "Loud and Clear" on Sputnik Radio. He was a CIA analyst and case officer, senior investigator for the Senate Foreign Relations Committee, counterterrorism consultant for ABC News, and author. He was the first U.S. government official to confirm in December 2007 that waterboarding was used to interrogate al-Qaeda prisoners, which he described as torture. On October 22, 2012, Kiriakou pleaded guilty to disclosing the identity of a fellow CIA officer. He was the first CIA officer to be convicted for passing classified information to a reporter, although the reporter did not publish the name of the operative. He was sentenced to 30 months in prison on January 25, 2013, and served his term from February 28, 2013, until February 3, 2015, at the low-security Federal correctional facility near Loretto, Pennsylvania, in general population, not in the neighboring minimum security work camp that has been reported. 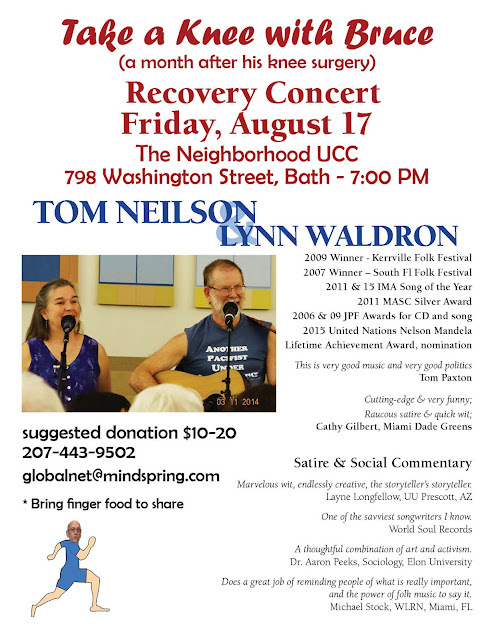 Tom Neilson and Lynn Waldron are long-time friends and excellent performers. Tom is an outstanding songwriter who uses irony and satire as well as anyone I've ever seen to tell stories about the political times we live in. His songwriting comes out of our people's movements. He grew up on a dairy farm and his heart remains close to the land. Over the years Tom has sung at quite a few Global Network annual meetings. He lives these days in western Massachusetts. You will enjoy this show - come along for some fun and 'take a knee' with me (the concert and the title for the event were Tom's idea which I immediately loved). I'm excited. Hope to see you there. In July Dr. Swee Chai Ang was sailing with the Freedom Flotilla ship al-Awda in an effort to break the 12 year old siege of Gaza. She is a consultant orthopedic surgeon at St. Bartholomew’s and the Royal London hospitals and co-founder of Medical Aid for Palestinians. Born in Malaysia and raised in Singapore, she came to the U.K. as a refugee. She was eyewitness to the 1982 Sabra and Shatila massacre in Beirut which she wrote about in From Beirut to Jerusalem: A Woman Surgeon With the Palestinians. Here is her account about what happened after the Israelis boarded the al-Awda in international waters on July 29, 2018. The last leg of the journey of al-Awda (the boat of return) was scheduled to reach Gaza on 29 July 2018. We were on target to reach Gaza that evening. There are 22 on board including crew with USD $15,000 of antibiotics and bandages for Gaza. At 12.31 pm we received a missed call from a number beginning with +81... Mikkel was steering the boat at that time. The phone rang again with the message that we were trespassing into Israeli waters. Mikkel replied that we were in International waters and had right of innocent passage according to maritime laws. The accusation of trespassing was repeated again and again with Mikkel repeating the message that we were sailing in international waters. This carried on for about half an hour, while Awda was 42 nautical miles from the coast of Gaza. We came directly into a closed military zone in Ashdod. It was a sealed off area with many stations. It was specially prepared for the 22 of us. It began with a security x-ray area. I did not realize they retained my money belt as I came out of the x-ray station. The next station was strip search, and it was when I was gathering up my belongings after being stripped when I realized my money belt was no longer with me. I knew I had about a couple hundred Euros and they were trying to steal it. I demanded its return and refused to leave the station until it was produced. I was shouting for the first time. I was glad I did that as some other people were parted from their cash. The journalist from Al Jazeera Abdul had all his credit cards and USD 1,800 taken from him, as well as his watch, satellite phone, his personal mobile, his ID. He thought his possessions were kept with his passport but when he was released for deportation he learnt bitterly that he only got his passport back. All cash and valuables were never found. They simply vanished. I was cold and hungry, wearing only one tee shirt and pants by the time they were through with me. My food was taken away; water was taken away, all belongings including reading glasses taken away. My bladder was about to explode but I am not allowed to go to the toilet. In this state I was brought out to two vehicles – Black Maria painted gray. On the ground next to it were a great heap of rucksacks and suit cases. I found mine and was horrified that they had broken into my baggage and took almost everything from it – all clothes clean and dirty, my camera, my second mobile, my books, my Bible, all the medicines I brought for the participants and myself, my toiletries. The suitcase was partially broken. My rucksack was completely empty too. I got back two empty cases except for two dirty large man size tee shirts which obviously belonged to someone else. They also left my Freedom Flotilla tee shirt. I figured out that they did not steal the Flotilla tee shirt as they thought no Israeli would want to wear that tee shirt in Israel. They had not met Zohar and Yonatan who were proudly wearing theirs. That was a shock as I was not expecting the Israeli Army to be petty thieves as well. So what had become the glorious Israeli Army of the Six Day War which the world so admired? At 6:30 am 31 July 2018, we heard Larry yelling from the men’s cell across the corridor that he needed a doctor. He was obviously in great pain and crying. We women responded by asking the wardens to allow me to go across to see Larry as I might be able to help. We shouted “We have a doctor” and used our metal spoons to hit the iron cell gate get their attention. They lied and said their doctor will be over in an hour. We did not believe them and started again. The doctor actually turned up at 4 pm, about 10 hours later and Larry was sent straight to hospital. When we arrived at Ramle prison Abdul found to his horror that his money, his credit cards, his watch, his satellite phone, his own mobile phone, his ID card were all missing – he was entirely destitute. We had a whip round and raised around a hundred Euros as a contribution towards his taxi fare from the airport to home. How can the Israeli Army be so corrupt and heartless to rob someone of everything? We, the six women on board al-Awda had learnt that they tried to completely humiliate and dehumanise us in every way possible. We were also shocked at the behaviour of the Israeli Army especially petty theft and their treatment of international women prisoners. Men jailers regularly entered the women’s cell without giving us decent notice to put our clothes on. We cannot accept this. We have to speak up, stand up against this lawlessness, oppression and brutality. We were completely unarmed. Our only crime according to them is we are friends of the Palestinians and wanted to bring medical aid to them. We wanted to brave the military blockade to do this. This is not a crime. In the week we were sailing to Gaza, they had shot dead 7 Palestinians and wounded more than 90 with live bullets in Gaza. They had further shut down fuel and food to Gaza. Two million Palestinians in Gaza live without clean water, with only 2-4 hours of electricity, in homes destroyed by Israeli bombs, in a prison blockaded by land, air and sea for 12 years. The hospitals of Gaza since the 30 March had treated more than 9,071 wounded persons, 4,348 shot by machine guns from a hundred Israeli snipers while they were mounting peaceful demonstrations inside the borders of Gaza on their own land. Most of the gun-shot wounds were to the lower limbs and with depleted treatment facilities the limbs will suffer amputation. In this period more than 165 Palestinians had been shot dead by the same snipers, including medics and journalists, children and women. The chronic military blockade of Gaza has depleted the hospitals of all surgical and medical supplies. 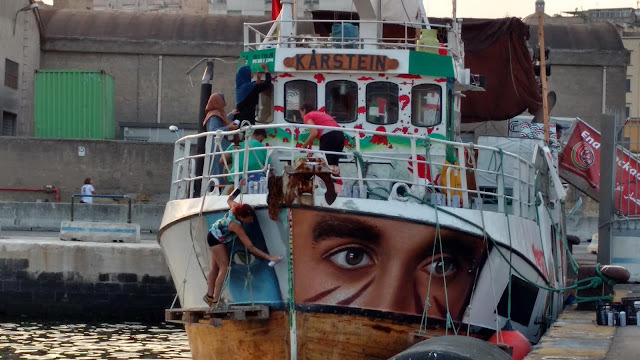 This massive attack on an unarmed Freedom Flotilla bringing friends and some medical relief is an attempt to crush all hope for Gaza. As I write I learnt that our sister Flotilla, Freedom, has also been kidnapped by the Israeli Navy while in international waters.